Wronged royal wife ...or£32bn queen of the gold diggers? THE woman inside the elegant town house in fashionable Rutland Gate, Kensington, just off Hyde Park, wanted to make certain facts clear to me. She said she was sick of all the lies being told about her. She wanted to put the record straight. Her enemies, friends of her husband, the billionaire King Fahd of Saudi Arabia, were engaged in a dirty war against her to blacken her name, she believed. Saudi sources in London have suggested that she is a fan of plastic surgery and has had a number of nips and tucks at Harley Street; that she is a devotee of Scientology, whose followers believe that humans are temporary vessels for immortal souls called Thetans; that she is addicted to gambling and blew hundreds of thousands of pounds on the blackjack tables in London’s casinos; and, most damning of all, that she was unfaithful and has had relationships with a variety of men. Certainly, it is not a crime. But the moment Janan decided to take on the might of the Royal House of Saud, her lifestyle was inevitably going to be subject to intense scrutiny. For in an unprecedented and astonishing manoeuvre, Janan, 58, is suing King Fahd through the British courts for what she calls ‘proper maintenance’. Eighteen months ago, when she filed for maintenance under Section 27 of the Matrimonial Causes Act, the king tried to claim ‘sovereign immunity’. The then president of the High Court family division, Dame Elizabeth Butler-Schloss, agreed to the king’s anonymity and even went as far as listing the action as Maple v Maple. But the Court of Appeal thought differently and ruled, last month, that the king’s identity was relevant. A hearing is now expected in November, much to the dread of King Fahd, who is in hospital with pneumonia and breathing problems. It is not the money that is the issue here. What obsesses the king is keeping secret the details of life within the Saudi kingdom. As always with stories regarding Saudi royals, there are lurid allegations of abusive behaviour. In 2001, Janan was paid a substantial sum for entering into a binding deed of confidentiality covering all aspects of her past relationship with the king. So why the need for the court case? Janan says it is not about the money but the principle. She feels bitter that she was discarded by the king and believes she deserves better treatment. So who exactly is Janan Harb and what has brought her to London to carry out what appears, superficially at least, to be an act of sheer madness? least 30 years and is now considered westernised. Perhaps in readiness for her court battle, she obtained a British passport six months ago. She lives alone in Knightsbridge in a lovely street where the houses are worth up to £10million each and has one maid in a small flat on the top floor. She does not own the property but rents for about £4,000 a month. She is in close touch with one of her daughters, Rania Bouiez, and her own mother, Jihan, who live in nearby Chelsea. She once had an aerobics franchise in London with outlets in Europe and the Middle East and has an interest in a wide range of alternative therapies. But much about Janan remains an mystery. Born a Palestinian Christian, she converted to Islam for her husband’s sake, before embracing Scientology. She claims to be still married to King Fahd although under Saudi marriage law, a man can divorce a woman without telling her. Janan herself has added to the mystery as she refuses to discount stories that she has enjoyed a number of other relationships. She is an elegant, intelligent woman who enjoys gambling in Mayfair’s exclusive casinos such as Aspinalls and The Ritz. One friend told me: ‘She always said Fahd had taught her how to gamble. Perhaps the contradictions in her life can be explained by her difficult childhood in the Middle East. Janan was born in Haifa in 1946 to George Harb, a restaurateur and Jihan, a seamstress from Nazareth. When the Israeli War of Independence began in 1948, the Harbs moved to Bisa’an, now Bet She’an, in the Jordan Valley, then to Nazareth in Northern Israel and then to Jericho. After nine hard years they moved to Ramallah, then under Jordanian rule, with Janan, her older brother Jalal and her younger sister and brother, Jawana and Jawwad. But the couple did manage to set up a modest, though successful, seven bedroom hotel and restaurant in an acre of land. The family lived in a small second-floor apartment next door. It was here, at the Hotel Harb, that Janan first glimpsed a world far removed from her own. Despite the modesty of their establishment, George and Jihan managed to attract an elite clientele from the wealthy Gulf states. The garden became one of the town’s favourite spots for music and parties, which neighbours still remember would sometimes last all night. The parties and free-flowing alcohol set the Christian Harb family apart from the more traditional residents of Ramallah, particularly the growing Muslim community. By the time Janan graduated from the Friends Girls’ School in Ramallah in 1967, the year the Israeli occupation began, she and her younger sister Jawana already had a reputation for being party girls. Janan was renowned for her beauty. Tall, olive-skinned, with lustrous dark hair and enormous brown eyes, one of the town’s photographers displayed a large portrait of her in his shop window. One friend from Ramallah who knew the girls well said: ‘They wore modern clothes and went dancing. Janan quickly found the town limiting. She had seen how the wealthy Arabs lived and in her late teens she left for the American University in pre-civil war Beirut, then a cosmopolitan city hailed as Paris of the Middle East. What happened to her studies remains unclear as from there she moved to Jeddah in Saudi Arabia, took a job with Yardley cosmetics and was spotted by Fahd, then still a prince. They were married in secret in 1969. By the time Janan told her parents, she was already installed in the vast, gilded world of the Saudi royal family. But for all its privilege it was not a happy time. Saïd K. Aburish, journalist and the respected author of The Rise, Corruption And Coming Fall Of The House of Saud, said: ‘She would have had a very difficult time if she had remained a Christian. Even the staff would have given her a hard time. Due to the obsessively secretive nature of the Saudi court no one even knows the names of all of Fahd’s wives, let alone just how many there have been over the years. Aburish said: ‘There are probably only three or four people in the world who know that. ‘Fahd could marry 500 times but he can only have four wives at a time and if he wants another he has to get rid of one of the four. He is also obliged to treat them all equally in every sense. ‘Of course, in reality, he decides on the ranking and obviously has his favourites. He would give some more money than others, some are allowed to breed and others are not. It’s up to him. The bizarre nature of the break-up means that no one can be sure when it ended, although it is believed to have been sometime in the early Seventies. JANAN’S post-Saudi life becomes decidedly sketchy – and possibly for very good reason. Members of the royal family are generous with the women in their life but their total loyalty is expected in return. Perhaps this is why Janan refuses to be drawn on the subject of relationships with people other than the king. But friends and family agree that she has shared her life with other men – indeed she has a daughter to prove it. Sources in Ramallah claim she married a wealthy American and went to live with him on Lake Michigan, but they were soon divorced. Whatever the nature of these relationships, one thing is certain – the full details will inevitably come out in court – if things go that far. But according to seasoned Saudi watchers, Janan need not be unduly worried. For, as she knows only too well, the royal family will pay almost any price to keep their affairs private. One royal insider said: ‘I very much doubt there will be an appeal in an open court and certainly no maintenance hearing. ‘The Saudis hate publicity and now that the British courts have decided the case can go ahead and in King Fahd’s name, they will almost certainly make a deal in private. Similarly, one imagines, the name Janan Harb is unlikely to be uttered again in the Saudi royal court. Kibbutz Ketura, Israel -- It has five leaves, stands 14 inches high and is nicknamed Methuselah. It looks like an ordinary date palm seedling, but for UCLA- educated botanist Elaine Solowey, it is a piece of history brought back to life. 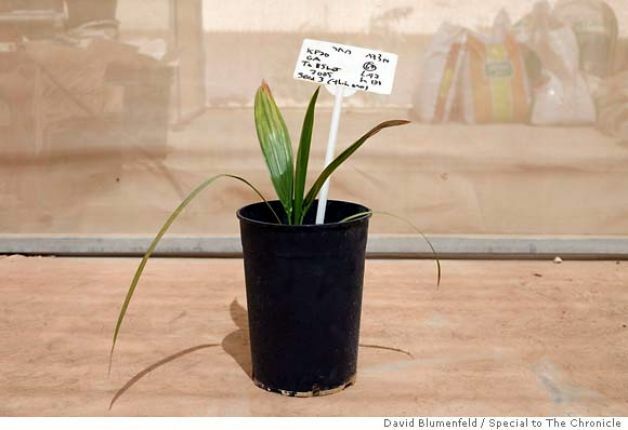 Planted on Jan. 25, the seedling growing in the black pot in Solowey's nursery on this kibbutz in Israel's Arava desert is 2,000 years old -- more than twice as old as the 900-year-old biblical character who lent his name to the young tree. It is the oldest seed ever known to produce a viable young tree. In collaboration with the Louis L. Borick Natural Medicine Center at Hadassah Hospital in Jerusalem, named in honor of its Southern California- based benefactor, Solowey grows plants and herbs used in Tibetan, Chinese and biblical medicine, as well as traditional folk remedies from other cultures to see whether their effectiveness can be scientifically proved. In experiments praised by the Dalai Lama, for example, Borick Center Director Sarah Sallon has shown that ancient Tibetan cures for cardiovascular disease really do work. The Judean date is chronicled in the Bible, Quran and ancient literature for its diverse powers -- from an aphrodisiac to a contraceptive -- and as a cure for a wide range of diseases including cancer, malaria and toothache. Greek architects modeled their Ionic columns on the tree's tall, thin trunk and curling, bushy top. The Romans called it Phoenix dactylifera -- "the date-bearing phoenix" -- because it never died and appeared to be reborn in the desert where all other plant life perished. Now Solowey and her colleagues have brought this phoenix of the desert back to life after 2,000 years. "When we asked if we could try and grow some of them, they said, 'You're mad,' but they gave us three seeds," she said. Sallon took the seeds to Solowey, who has cultivated more than 3,000 date palms and rarities like the trees that produce the fragrant resins frankincense and myrrh. Solowey admits she was skeptical about the chances of success with this project. 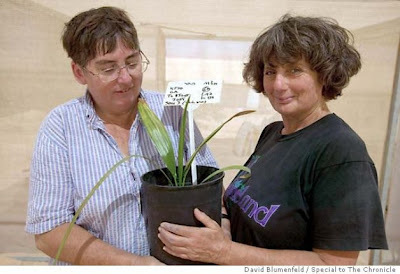 "When I received the seeds from Sarah, I thought the chances of this experiment succeeding were less than zero," said Solowey, cradling the precious seedling in a specially quarantined section of her nursery on the kibbutz. "But Dr. Sallon insisted and I took this very seriously. Lotus seeds over 1,000 years old have been sprouted, and I realized that no one had done any similar work with dates, so why not give it our best shot -- and we were rewarded." "Much to my astonishment, after five weeks, a small little date shoot came up," she says. "It was pale, almost whitish green. The first two leaves were abnormal-looking. They were very flat and very pale. The third leaf started to have the striations of a normal date plant. Now it looks perfectly normal to me. "The only difference between this date seedling and any other date seedlings I've seen come up is the length of the third leaf. This is very unusual," she said, pointing out one very long, thin leaf growing out of the pot. "It's certainly the oldest tree seed that's ever been sprouted. Wheat seeds from pharaohs' tombs have been sprouted, but none of the plants have survived for very long. Before this, the oldest seed grown was a lotus from China, which was 1,200 years old," she said. "I'm very excited. I wasn't expecting anything to happen. I'm really interested in finding out what the DNA testing is going to show. I know that date seeds can stay alive for several decades. To find out that they can stay alive for millennia is astonishing." "We have to figure out where we can put it so it can grow to maturity. Then we'll hope that it grows up and flowers so we can figure out whether it's male or female, and then it has offshoots and seeds so we can propagate it. It's very exciting to think that maybe someday we can eat 2,000-year-old dates, but there's a 50 percent chance that it's a male, in which case that won't happen," she said. Sallon trained as a pediatrician and gastroenterologist, and she once worked with Mother Teresa at the Sisters of Charity orphanage in Calcutta. She founded the Louis L. Borick Natural Medicine Center 10 years ago and is a world-renowned expert on the medical properties of plants. "It feels remarkable to see this seed growing, to see it coming out of the soil after 2, 000 years. It's a very moving and exciting moment," she said. Once the seed sprouted, samples of seeds excavated from the same cache on Masada were sent to the University of Zurich for radio-carbon dating. The results came back last week, showing the samples were 2,000 years old, plus or minus a margin of error of 50 years, placing them during or just before the Masada revolt. "Perhaps one of our ancestors was sitting there on the battlements of Masada eating his dates while the Roman armies were preparing for the final siege and perhaps nonchalantly spitting out a pip," said Sallon. "Two thousand years later, here I am at Kibbutz Ketura and it's grown." "I find it remarkable," said Cohen. "Two thousand years ago, during the Roman Empire, Israel was known for the quality of its dates. They were famous throughout the Roman Empire. But date growing as a commercial fruit export stopped at the end of 70 A.D., when the Second Temple was destroyed by the Romans. From then, the tradition was lost. "It's an interesting question what were the ancient dates like. We hope by genetic analysis, we can learn more about the character of the ancient date population." When the Romans invaded ancient Judea, thick forests of date palms towering up to 80 feet high and 7 miles wide covered the Jordan River valley from the Sea of Galilee in the north to the shores of the Dead Sea in the south. The tree so defined the local economy that Emperor Vespasian celebrated the conquest by minting the "Judea Capta," a special bronze coin that showed the Jewish state as a weeping woman beneath a date palm.